Superconductor materials are prized for their ability to carry an electric current without resistance, but this valuable trait can be crippled or lost when electrons swirl into tiny tornado-like formations called vortices. These disruptive mini-twisters often form in the presence of magnetic fields, such as those produced by electric motors. To keep supercurrents flowing at top speed, Johns Hopkins scientists have figured out how to constrain troublesome vortices by trapping them within extremely short, ultra-thin nanowires. Their discovery was reported Feb. 18 in the journal Physical Review Letters. "We have found a way to control individual vortices to improve the performance of superconducting wires," said Nina Markovic, an associate professor in the Department of Physics and Astronomy in the university's Krieger School of Arts and Sciences. Many materials can become superconducting when cooled to a temperature of nearly 460 below zero F, which is achieved by using liquid helium. The new method of maintaining resistance-free current within these superconductors is important because these materials play a key role in devices such MRI medical scanners, particle accelerators, photon detectors and the radio frequency filters used in cell phone systems. In addition, superconductors are expected to become critical components in future quantum computers, which will be able to do more complex calculations than current machines. Wider use of superconductors may hinge on stopping the nanoscopic mischief that electron vortices cause when they skitter from side to side across a conducting material, spoiling the zero-resistance current. The Johns Hopkins scientists say their nanowires keep this from happening. Markovic, who supervised the development of these wires, said other researchers have tried to keep vortices from disrupting a supercurrent by "pinning" the twisters to impurities in the conducting material, which renders them unable to move. "Edges can also pin the vortices, but it is more difficult to pin the vortices in the bulk middle area of the material, farther away from the edges," she said. "To overcome this problem, we made a superconducting sample that consists mostly of edges: a very narrow aluminum nanowire." These nanowires, Markovic said, are flat strips about one-billionth as wide as a human hair and about 50 to 100 times longer than their width. 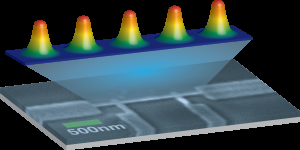 Each nanowire forms a one-way highway that allows pairs of electrons to zip ahead at a supercurrent pace. Vortices can form when a magnetic field is applied, but because of the material's ultra-thin design, "only one short vortex row can fit within the nanowires," Markovic said. "Because there is an edge on each side of them, the vortices are trapped in place and the supercurrent can just slip around them, maintaining the resistance-free speed." The ability to control the exact number of vortices in the nanowire may produce additional benefits, physics experts say. Future computers or other devices may someday use vortices instead of electrical charges to transmit information, they say.